We provide several different tools for Battlefield 3, all of them available entirely for free. This page gives you an overview of each of our tools. 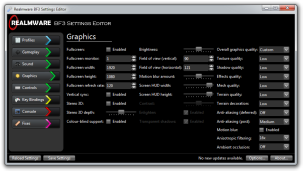 BF3 Settings Editor is a useful tool which allows you to easily customise and tweak all of your Battlefield 3 settings, including the ones that aren't displayed on the in-game menu. Supports the majority of standard game settings. Allows you to bypass in-game limits. Tweak hidden settings and key bindings. Apply fixes for various game bugs and issues. Store multiple settings files with the built-in profile manager. 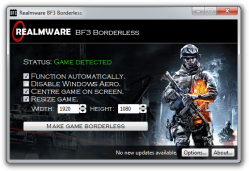 BF3 Borderless is a simple program which gives you control over the window that Battlefield 3 runs in. 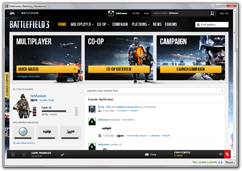 The main purpose of this is to run Battlefield 3 in a fullscreen window, making it easier to switch to other programs. Automatically detects when the game is running and applies your settings. Remove the border on the game's window. Resize the game window to any exact size that you want. Automatically centre the game on your screen. Avoid lag and glitches which occur in standard fullscreen mode. Battlelog Standalone is a simple program which provides access to the Battlelog website through a kind of simplified web browser. Its aim is to simplify the process of accessing Battlelog, and save system resources while playing Battlefield 3. Automatically navigates to the Battlelog website on start-up. Fully supports the Battlelog website, including the browser plugin. Launches more quickly than other web browsers. Uses less memory than other web browsers. 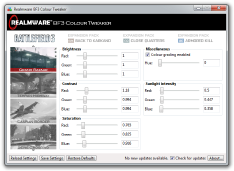 Realmware BF3 Colour Tweaker is a simple program which allows you to edit the Battlefield 3 game files by tweaking the colour and lighting settings for each map. Tweak the colour and lighting settings for every map in the game. Tweak the brightness, contrast, and saturation for every map in the game. Fully remove colour grading as well as the infamous blue filter. Much more effective results than the FXAA Injector. No FPS loss — if anything, your FPS will increase!